I got to know of this book after I saw it on James Gurney's blog. I had thought he authored this book but it turned out that he wrote the introduction and selected the featured artworks. The essays included are written by Claude Keisch and Claudia Czok. The goal of the book, as mentioned by James Gurney, is to highlight an artist who is not well known outside Germany. Adolph Menzel is a German artist and a prolific sketcher. He's said to have drawing supplies everywhere he went and lives by the motto "Not a day without a line". After he died in 1905, he has filled over 100 sketchbooks. This book shows some of his sketches and paintings. The guy is a master at painting portraits. The black and white portraits and figure drawings are wonderful, at a standard that's comparable to the old masters. His pencil work is very textural. And this texture can be seen in some paintings which gives them an interesting style. In all, there are 98 black and white pieces and 32 colour plates of his work. The essays included talk about his life, career, studio and his drawings at the Kupferstichkabinett Museum. Adolph Menzel's work rate is inspiring and so is his work. 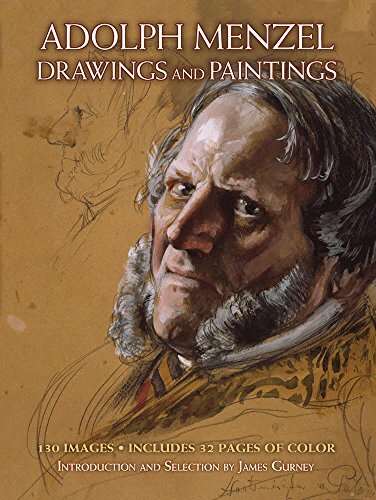 I recommend this book to those who like portraits and figure drawing, and who want to learn more about painters from the past.